What is the best reference when it comes to a vacation in Papua Province? Well, it is hard to tell the best one, as many options are available. One of them is called Baliem Valley, which is located near to Jayapura City. To be exact, the value is situated around Jayawijaya Mountain. It is the home of several tribes, including Lani, Yali, and Dani. The location is on 1,600 above the sea level. No wonder, the air is quite cold, especially at night. Apart from the nature views, tourists visit the Baliem to witness numerous traditional performances and attractions of the locals! As mentioned before, the valley becomes the home of numerous local tribes. That means some tourists can find several traditional houses in the location. Not to mention many types of trees grow well there. Still, most parts of the valley are surrounded by mountains. Due to its location, the temperature is quite cold and refreshing. It is suitable to eradicate stresses, though. Also, visitors have an opportunity to get along well with villagers. They are friendly and live in a traditional way. Plus, they have many unique festivals to watch. It is true that many types of traditional performances are held in Baliem Valley. This is good news for tourists. One of the best ceremonies is the war dance, which is conducted by different tribes (Yali, Lani, and Dani). The local call it “Festival Perang” and it is a prime attraction in Baliem. It is not a real war. Instead, it is considered a dance that lasts for about 3 days. Usually, the locals perform it once every year and tourists can witness it in August. There is even a philosophy behind it, which is “yogotak habuluk motog hanaro”. It means “tomorrow should be better than now”. The next popular attraction in Baliem Valley is Bakar Batu Ceremony. Not only it is conducted among people in Baliem, but it is also popular in other parts of West Papua Province. Simply said, the tradition belongs to Dani Tribe and it is conducted during numerous types of events. These include weddings, births, deaths, euphorias, etc. People would gather in one location and grill several foods together. The thing is they include many stones during the cooking festival. That’s why the name has “batu” in it, which means “stone”. What’s next? Apart from local traditions, Baliem Valley is famous for nature beauty. Some parts of the valley consist of white sand, which is similar to that of the beach. According to the locals, there was a lake back then. Due to an earthquake, the lake disappeared and turned into a valley. Today, it becomes a recommended tourist spot in West Papua Province, especially Jayapura City. Baliem Valley belongs to Jayapura City and it is located near to Jayawijaya Mountain. First, tourists should take an airplane to Sentani District. 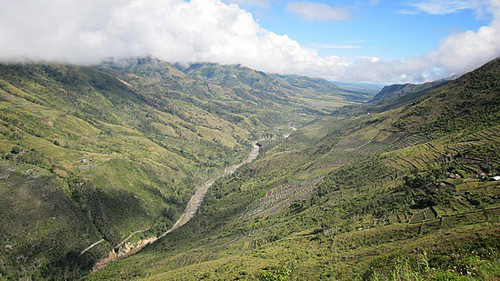 Next, it is time to head to Wamena and reach the valley with the help of a tour guide.